The paperless office stationery cupboard? 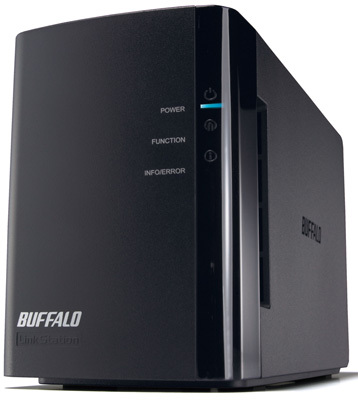 Review Buffalo Technology’s latest Nas box, the Linkstation Duo has been targeted to meet the ever-increasing multimedia and storage needs of home and small office users. Offered in 1TB, 2TB and 4TB capacities, it sports two Sata II hard drives that can be easily swapped out for user upgrades. The 1TB edition we reviewed utilises two 3.5in Samsung HD502HI EcoGreen drives running at 5400RPM and was preconfigured in RAID 0 mode, allowing for 902.9GB of true storage. Also configurable to RAID 1 and it performs are a DLNA-certified media server, with support for iTunes, Apple’s Time Machine and even the hooks up with the iPhone. Other features include remote operation with WebAccess as well as FTP and USB print server use and power saving modes. The Linkstation Duo uses an external 110/240v PSU and comes with both UK and EU mains leads, and a 2m flat Ethernet cable. The setup CD also includes Memeo Autobackup for both Windows and Mac. Evidently, Buffalo hasn’t cut corners on build quality, as the Linkstation Duo is sturdy with its 2.3kg weight enough to keep it securely planted on your desk without making it a burden to move or carry. Measuring up at 86 x 204 x 127mm, the unit has no gimmicky switches or dials, simply a set of indicator LEDs neatly concealed behind tinted acrylic and some nicely styled air intakes. 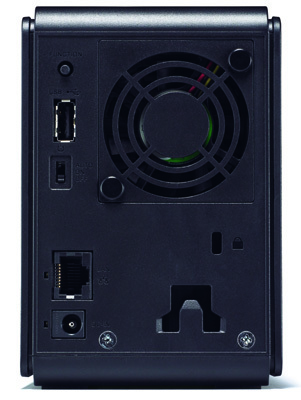 Set up is simple, just plug into your network and instal the included Nas Navigator software. On first run, the software will auto detect the drive and list those it finds (if you have more than one). From here, the menu allows the mapping of drives to local disks, placement of drive shortcuts on the desktop and access to the web configuration page. The web configuration interface is uncomplicated and easy to navigate, however, it can be slow to load and accessing certain settings can be somewhat time consuming and makes for a rather tedious user experience. Overall, the layout is pleasant to use and provides enough detailed information without becoming overwhelming and is certainly well-suited to the average home user. Analysis Who needs DAS with RDMA? Analysis What's with the sudden boom in latency serial killers?